JSE Imaging Solutions offers development of OEM TWAIN drivers for scanners, digital cameras, frame grabbers, web cams and other image acquisition devices. We develop WIA drivers for all Microsoft Windows platforms as well as Image Capture drivers (ICA) for macOS. JSE develops TWAIN components since the early days of TWAIN in 1994. 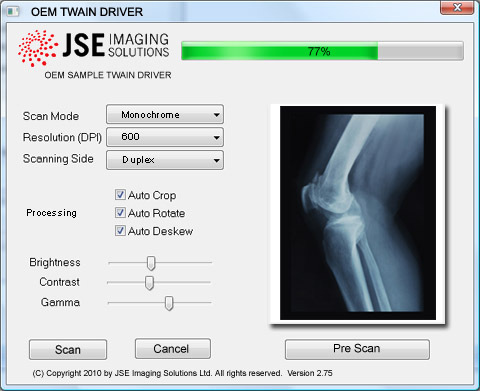 A basic part of the JSE OEM TWAIN data sources is a superior color management technology which improves the hardware image quality and post scan processing technology which gives the user better scan results. JSE develops also imaging applications, utilities and WIA drivers tailored for the demand of OEM customers. We are offering a one stop solution for scanner and camera vendors, as we can complete driver development, creation of Windows Device Experience and the full testing for submission. As well we offer full WHQL and Windows HCK service for imaging devices. Any inquiries for OEM development are welcome and will be answered prompt and confidential. TWAIN Integration Kit, TIKX, JTWAIN, TWAINCommander, TWAINGo, XPCTWAIN, BARISEI, breeze, StampRIP, CluePrint, XPCsign, CamCommander, WIACommander, iTides, iDentView , MARIxR, ENCLESO, DeviceGrade and SmartRotate are trademarks of JSE Imaging Solutions. JSE and the JSE logo are trademarks of JSE Imaging Solutions. All other names and brands are trademarks by their holders. WebDesign by JU! Marketing Consulting. The Impressum is located at the buttom of the contact page.